Local arts enthusiasts may know Susan McCarrell’s distinctive mixed media work from her award-winning entries in the annual Fall Art Show and Sale. Combining sepia-toned photographs, archival newsprint text, and textured media, she creates haunting imagery with layers of meaning. Now Susan has her own exhibit! 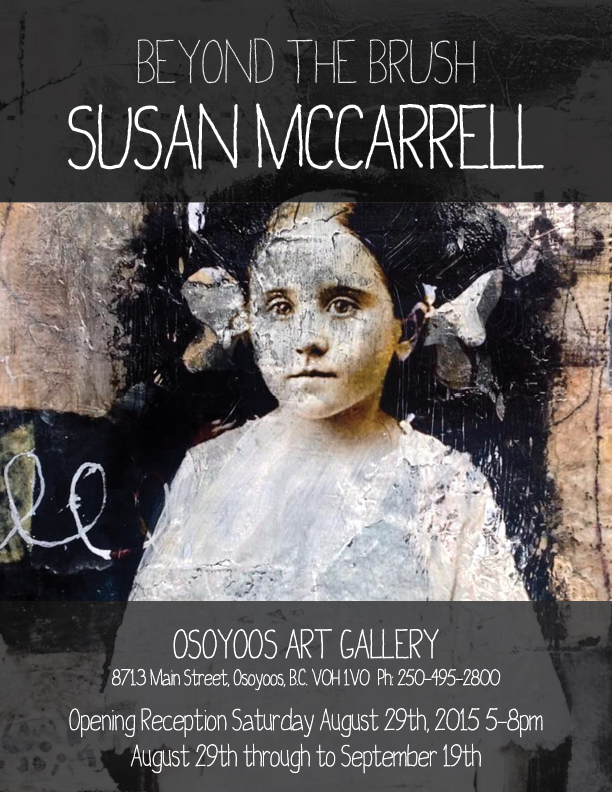 Opening Reception is August 29th at the Osoyoos Art Gallery, and the show runs until September 19th. Eclectic yet focused, Susan McCarrell’s mixed media works are reflections on memory, rituals of life, including celebrations, successes and hiccups. She owns a unique style which is energetic, playful, bound by discipline and tradition. Her art confronts the ups and downs of modern life with connections to similarities of past lives with strong feminine energy. Using a combination of mixed media, photography and historical images, she likens her art to a ‘construction’ to produce her natural and organic pieces. A thread runs through Susan’s work that makes it unmistakably hers. Susan relocated from Vancouver, British Columbia to the South Okanagan, British Columbia in 1996.